Traditionally, federal income taxes must be filed with the IRS on, or before, April 15 each year. The date has become such a part of U.S. culture that many people simply call it "Tax Day". 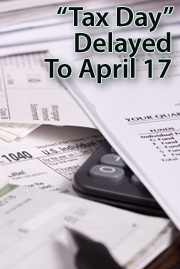 This year, however, for the 3rd time in 7 years, your federal income taxes will not be due April 15. Instead, because of a combination of the calendar, a holiday, and tax law, Tax Day 2012 is delayed until Tuesday, April 17. You will have two extra days to prepare and file your federal income taxes this year. Here's why. First, April 15 is a Sunday and all federal offices are closed on Sundays. This means that that taxes can't be filed on April 15, as regularly scheduled. Rather, the tax due date should roll over to the first available business day -- Monday. However, Monday, April 16 is Emancipation Day, a holiday in the District of Columbia since 2005. Emancipation Day honors President Abraham Lincoln's April 16, 1862 signing of the Compensation Emancipation Act. All of Washington, D.C. is closed for the local holiday -- including the offices of the IRS. Taxes can't be due on this date because there will be nobody at the Internal Revenue Service to receive them. Therefore, Tax Day rolls over to the next available business day, and that's Tuesday, April 17. Despite the 2-day change, as a reminder, the deadline to file a federal tax return with extension has not changed. That filing date remains October 15, 2012. Also, note that most states have chosen to mirror the IRS' tax deadlines this year even though Emancipation Day is a Washington, D.C-specific. Be sure to check with your accountant to confirm your local filing deadline.